Catwalk Radio can stream your PC's audio over your ethernet network to your UPnP media renderer, (eg Linn DS, or Roku Soundbridge). I use this feature to listen to BBC iPlayer on my DS. To enable this feature you must first set your PC sound input to "Stereo Mix". To do this, open the Volume Control Panel, and then select the "Options | Properties" menu item. Change the "Mixer Device" to "input", and ensure the "Stereo Mix" item is checked. In the new "Recording Control" dialog, you can now set the recording device to "Stero Mix" by selecting the appropriate check-box. You can now listen to your PC's Audio on your DS by selecting the "Default Audio Input" with your favourite UPnP Control Point, or with a right-click from the Catwalk Radio window. Catwalk Radio can stream audio from any analogue device that is connected to your PC's audio input. I use this feature to listen to FM radio throughout my home on my UPnP Media Renderers, (I've also used my iPod via its headphone jack!). Set up your PC with an analogue audio source plugged in to its line/mic input. If you're doing this for the first time, you can confirm the set up works with 'Sound Recorder' in the accessories menu. Download and run the installation file. 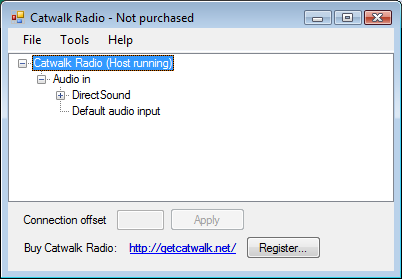 Run 'Catwalk Radio' from your Start Menu. After a few moments, the window should display 'Catwalk Radio (Host running)', and a tree view of the audio inputs of your PC. Now move to your favourite uPnP controller (e.g. LinnGUI), and browse the 'Catwalk Radio' Media Server. Browse to the 'Audio In' folder, and then select the music track 'Default audio input'. Set this to be played on a uPnP renderer (e.g. a DS family device). You can now hear whatever is fed in to the PC's line/mic input, on your DS. You can send the same music track to multiple devices, and they will all play the same audio. For each hi-fi that you want to listen to the music on, use your controller to set its input to be the music track 'Multi-room source.wav' which is on the 'Catwalk Radio' media server. Before starting, please be aware that this beta release is limited to playing CD quality (44.1Khz, 16bit stereo) WAV files only. If you don't have any of these, your media server may be able to convert to that format on the fly. (Asset UPnP has this capability). Once you have set up your Catwalk Radio Source you can stream this audio to as many DSes as you like. This features provides something that is often known as 'party mode' - the ability for all the hi-fi on your network to play the same music simultaneously. To provide multi-player playback, Catwalk radio provides two uPnP devices on your network. 'Catwalk radio input' is a renderer like your hi-fi that you send music to. 'Catwalk Radio' is a media server that sends whatever music is received by 'Catwalk radio input' to your hi-fi.